13 & 9’s Martin Lesjak and Anastasia Su. Based in Graz, Austria, 13&9 was born in 2013 through an interdisciplinary partnership between architect Martin Lesjak and designer Anastasia Su after the pair won an international competition for their conversion and redevelopment of Cannon Hall at the Graz Armory, called Rolling Stones. Now — just three years later — the product design firm has received global acclaim for its eclectic product collections and original design philosophy. Inspired by collaboration, 13&9 not only designs, produces and sells its own branded products, but it has also entered into several successful partnerships with top international manufacturers. The pair made its flooring debut last year in a joint venture with the Mohawk Group and had its second successful showing with additional carpet launches at NeoCon 2016. The team’s achievements in furniture, lighting, fashion, accessories, art, sound design and now flooring speak to 13&9’s inquisitive yet humble nature. Green Operations sat down with Lesjak and Su to get a deeper look into what makes 13&9 exceptional. Q: WHERE DOES THE NAME 13&9 COME FROM? purpose is based in our larger community. I (Anastasia) suggested we use numbers. I have a number — 13 — that has followed me my entire life, from my day of birth to other significant moments. Martin’s number is 9. It’s his soccer number and very personal for him. We decided these numbers fit very well together as they symbolize partnership and something personal we built together, but are also understandable and memorable to the world. Q: WHAT IS 13&9’S APPROACH TO DESIGN? Lesjak and Su founded 13&9 after collaborating on the award-winning redesign project Rolling Stones in Graz, Austria. A: From the very beginning we made sure to have strong conversations about what we really wanted to do with our partnership. We came up with “The Soul of Design” as our brand statement to represent our philosophy: to have products that are able to tell stories and connect and interact with people. We thought this term would help people see the value in our designs. It’s so important to us to find relevance in the things we do. We don’t want to just design another nice thing, but to find meaning and purpose depending on social, ecological, technological or individual relevance. Our projects have to give something away, not just create material objects. We’re bringing products to life — giving them a soul — with a multidisciplinary approach. The members of our team are all from very different backgrounds, which is not common but such a special thing. Q: WHAT ARE A FEW ADJECTIVES THAT BEST DESCRIBE YOUR PRODUCTS? A: Transformative, soulful, flexible, interactive and playful. Q: CAN YOU TALK ABOUT YOUR PRODUCT MIX? WHAT DETERMINES THE INDUSTRIES AND SEGMENTS YOU DESIGN FOR? A: Basically we are very curious. We don’t think about ourselves as specialists because we are driven by a universal curiosity. So, we see the potential for new products or innovation everywhere. This is why we have such diverse products. It’s also something we teach our team — to stay open as much as possible. We like to bring our whole team together and try to push boundaries with out-of- the-box thinking. The decision for a design often comes from an individual’s background, whether it’s fashion, architecture or something else. We also get requests from other companies, and when we feel there is a propensity to develop something we go for it. Q: DOES SUSTAINABILITY PLAY A ROLE IN YOUR PRODUCT OR PARTNER DECISIONS? our corporate strategy. On one hand there’s relevance and soul, but on the other hand it’s how we deal with our environment. Looking to see if something can be part of a circle economy, use sustainable materials or be multifunctional is at our core. For example, when we collaborate with someone we want to know everything about their production process and materials so we can learn from each other and maybe even offer different sustainable options. Q: ON THE COMMERCIAL BUILDING SIDE HAVE YOU SEEN A DEMAND FOR MORE SUSTAINABLE PRODUCTS? A: It’s funny, but we like to say the millennials will save the world. The upcoming generations have grown up in a digital world where information is at their fingertips. They need transparency and genuinely want to know the stories and approaches behind the products they purchase. With that, sustainability is not just a marketing idea anymore, it needs to be the true essence of a project. So, the answer is yes. There is movement in the millennial generation to push for even more transparency and environmental responsibility. Q: WHAT ELSE ARE YOU FINDING THE COMMERCIAL END USER LOOKING FOR TODAY? A: Transparency is very important as we mentioned, but commercial end users also really want to have an experience. They’re looking for products they can interact with. This experiential part of product design is very fruitful today. The idea of expanding boundaries and crossing borders is also growing. We are seeing a bond happening between working and living. Multitalented products that can be used in both residential and commercial are becoming very interesting. Q: TELL US ABOUT YOUR ENTRANCE INTO FLOORING VIA YOUR PARTNERSHIP WITH THE MOHAWK GROUP IN 2015 AND 2016. HOW DID THAT UNFOLD? Topography, a modular carpet collection with five tiles varying in size, geometry and texture. A: I (Martin) have always been interested in flooring from my architecture background. Some firms don’t give flooring the same weight as other aspects of a project, but we’ve always seen flooring as one of the major surfaces in a space. So, we’ve played a lot with flooring, but as a product designer this was a new opportunity for us. When Mohawk came to us, we were very interested in the individualization of flooring. 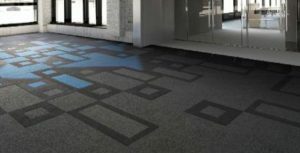 We wanted to push boundaries and know how we could create a floor that offers endless design options and interacts with people. Mohawk was very open to our ideas, and we all saw this unconventional approach as an opportunity. Q: WHAT WAS THE DESIGN PROCESS WITH MOHAWK LIKE? A: We always start any project with this question: What is the idea and relevance? We had a lot of conversations with our team around what flooring we would want for our own interior design use. We came up with a concept and brought it to Mohawk’s team. Then the real collaboration started. It’s important to not be superficial, but to allow ourselves to go further with our partners and understand them. We really wanted to be involved in every part of the process and know Mohawk’s design DNA, vision, production process and materials. They brought their experience and expertise, and we always tried to push them as far as possible. A big push is usually good! Q: YOU ALSO DESIGNED THE MOHAWK GROUP’S SHOWROOM AT NEOCON THIS YEAR. WHAT WAS THE CONCEPT THERE? A: After the success of our Moving Floors collaboration in 2015, this year’s partnership with Mohawk was not just about a product design. Instead we worked together to enhance Mohawk’s design awareness and strategy, which came with the opportunity to deconstruct and recreate its NeoCon showroom. The concept was a stage for flooring, and we wanted to create the maximum open space that showcased the floors at every angle. What I (Anastasia) really loved about this project was the transformative atmosphere Martin was able to make. Using mirrored walls at a slight angle made the floors look like they were on the ground, walls and ceiling. It’s a very sustainable space and doesn’t feel like a showroom but a multidimensional room. It was also fun to look at the atmosphere during NeoCon and see how people were interacting within the space. 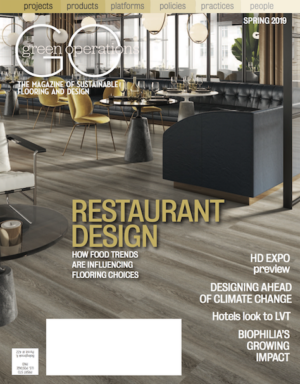 Q: DO YOU FIND THAT YOU APPROACH FLOORING DESIGN DIFFERENTLY THAN OTHER PRODUCTS? 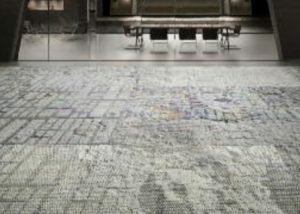 Moonscapes, a broadloom carpet inspired by the abstract patterns of the moon’s landscape, and can be cut and reconfigured into larger floorscapes. A: Our approach is always similar. Start with good questions. But, we’ve learned a lot launching Moving Floors, Topography and Moonscapes with Mohawk. We’ve explored the process for more than two years now and have truly fallen in love with flooring. It’s definitely something we would love to continue and look at taking on again. Q: HOW HAS 13&9 EVOLVED SINCE ITS INCEPTION? A: We’ve developed a lot both personally and professionally. We have a great team that we continue to grow consciously, and we’ve had the chance to work internationally in many different fields on products that have created relevance. When you imagine we just started three- and-a-half years ago, and today people know who we are it’s much more than we expected at our first meeting. But we didn’t really have any expectations, just vision. Q: WHAT’S BEEN YOUR GREATEST CHALLENGE AS A DESIGN TEAM? A: Every day has some kind of challenge, but we can’t see any great challenge because we are very solutions oriented. Challenges are often a positive for us. They are like some kind of playground. Challenges are opportunities, and opportunities are challenges. We also balance each other very well and come from different points of view, which helps. Q: WHAT’S NEXT FOR 13&9? A: Our collaborators BuzziSpace, Lande and Quinze & Milan will introduce several of our products and office furniture collections at this year’s Orgatec in Cologne, Germany. Then in November we are going to introduce our collaboration with Mohawk’s hospitality brand Durkan at BDNY in New York. 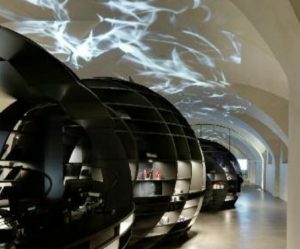 There will be additional product launches in the upcoming year at Salone del Mobile in Milan, Italy. We are also excited to have been invited to lecture at the University of Applied Sciences FH Joanneum in Graz, Austria, and Martin will be giving a guest lecture at Savannah College of Art and Design. Q: WHAT ADVICE WOULD YOU GIVE DESINGERS TODAY? A: Stay curious, cultivate your passion and be collaborative!